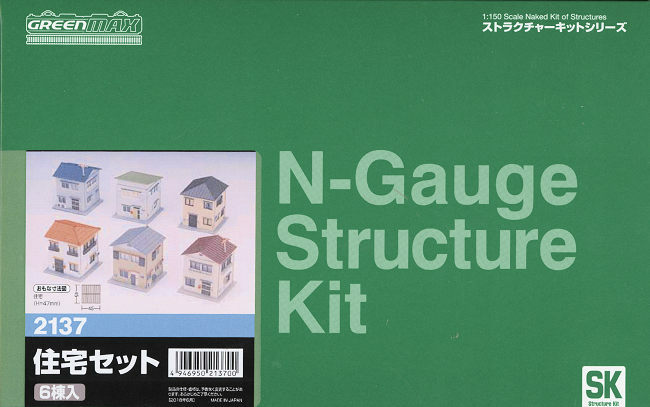 NOTES: "1:150 Scale Naked Kit of Structures". Those of us who like model railroading know that a train layout without structures is boring. We also know that ready to install structures can get pricey with even small structures, especially with esoteric layouts, can run $10-30.00 apiece. There are two ways to deal with this. One is to build your own from plastic and wood sheets. For those of us with less skill, kits are a reasonable solution. Many companies produce very nice printed paper kits and I've tried to build them but failed miserably. Another are plastic kits. This is one of those kits. Greenmax is a major N-gauge train manufacturer who make a wide range of products from RtR trains to train kits, structures and other bits. Their RtR trains are some of the more expensive plastic trains around, but their kits for buildings are quite reasonably priced and sell out very quickly. 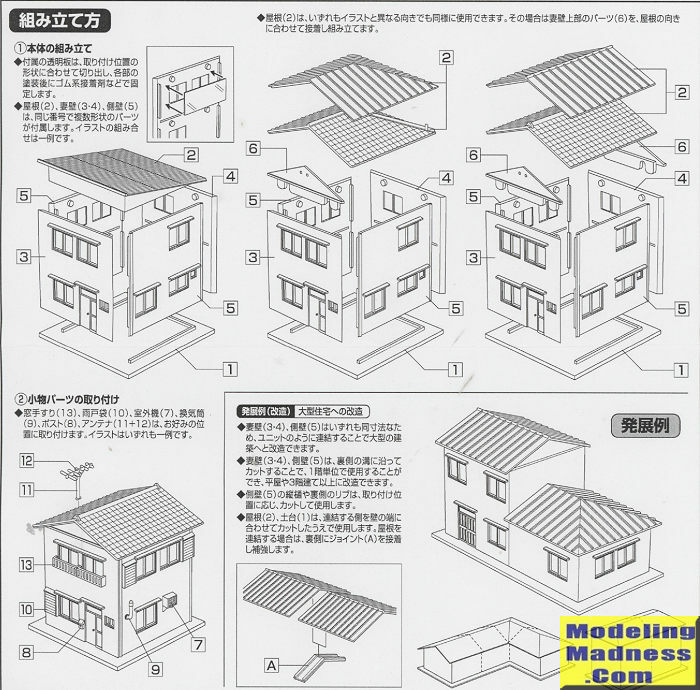 This set is for house structures. You are provided the ability to build six separate two story houses or you can combine these into larger buildings. There are two sprues of 44mm x44mm bases, two for roofs, and the rest for walls. Two of the wall sprues include things like mailboxes, TV antennas, balcony fencing, and so on. No painting instructions are provided, but you can use the examples on the box. You can also reduce the height of the walls if you want to do an addition to a house that is a single story. Each wall is etched on the inside to make cutting easier. For those wanting to make a 'double wide' a pair of connectors for the roofs is provided, though these are not for the flat roof pieces. 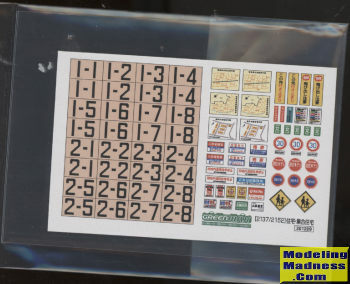 The kit comes with some generic stickers and several small sheets of clear acetate to be cut out and used for glass in the windows. Instructions are pretty straight-forward and are entirely in Japanese, but easy to decipher. Painting should be easy enough; just use a lot of earth tones. It is a good way to help increase the number of buildings on one's layout and fits in with anything built in terms of affordable housing in the last 40 years or so in Japan.